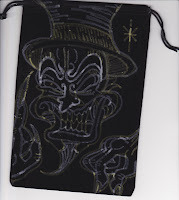 The artist did more than just create another niche deck - based upon the WCS yes but merged it with her own lifestyle, a deck by a juggalo for juggalos this gives us fresh images to look at, wonder over - and at times even be puzzled. 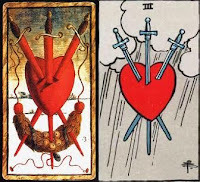 To extend and maximise the transformation of the tarot into this culture the artist renamed the suits into: Gats (Wands), Axes (Swords), Duckets (Pentacles) and Faygos (Cups) and also changed the court cards into Joker, Warrior, Queen and King. Does all this mean it can only be truly be enjoyed by those it was created for? Not at all everything from our well know classic WCS-deck is there only spiced-up to become this new incarnation. It's a tarot that makes no concessions, it's strong, wild raw in your face no way avoid it! 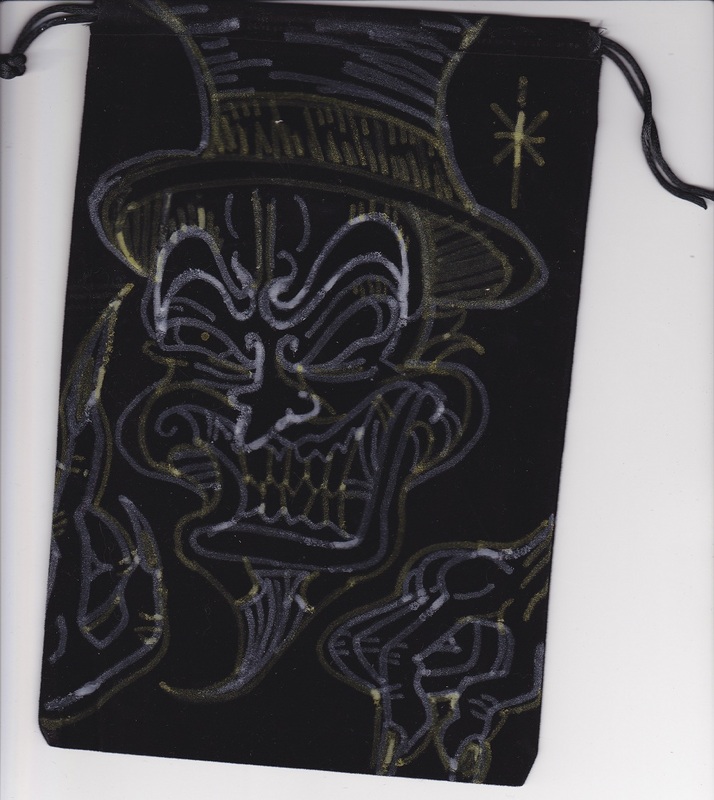 If after all this you are curious about it the deck has it's own Facebook page and on Etsy (where you can choose between differen pouch designs and preferred colors)you can buy them directly from the artist, and it's also availlable at Tarot Garden . Yesterday was a special and memorable day for my collection, 2 new decks arrived or to better put it 2 editions of this historical important deck. Both editions are high quality reproductions of the deck faithful to the original! The difference are ever so slight between both editions of the Sola Busca, there where both are offering the deck in it's original size the Mayer/Berti cards have a very discrete border around the cards rendering them a bit larger than the one reproduced by Osvaldo Menegazzi, the second difference is that the Il Meneghello Sola Busca is a bit darker in hue. The Sola Busca is an important deck for many reasons, first it's age at the beginning at the official history of the Tarot, and it is the only complete 78 cards deck that has survived into our age. It was also the FIRST deck (and only for many centuries) to portray all minor arcana cards as ilustrated images not solely as a numerical representation of the suit emblems + court cards. The deck is said to have been a great inspiration to Pamela Colman-Smith who has drawn the Waite-Colman Tarot one of the best known, used, sold and used as inspiration for other tarot's deck of the 20th century, the influence can for example be seen in the 3 of Sword. As a food starting point more information about the Sola Busca visit the Tarotpedia page dedicated to it. You can find more out about this deck at Berti's Facebook page here or at his website here or you contact him via email here. Il Meneghello obtained from the Ministry of Heritage and Culture and Pinacoteca di Brera (where it is housed) the exclusive rights to reproduce the deck directly from the original cards, and is offering it in a limited edition of 400 majors only decks. For more information about this edition see the Il Meneghello Facebook page here, this deck's Facebook page here or contact Christina Dorsini here. Both decks deserve my 2 thumbs up and made this collector extremely happy and proud by their presence in my collection. 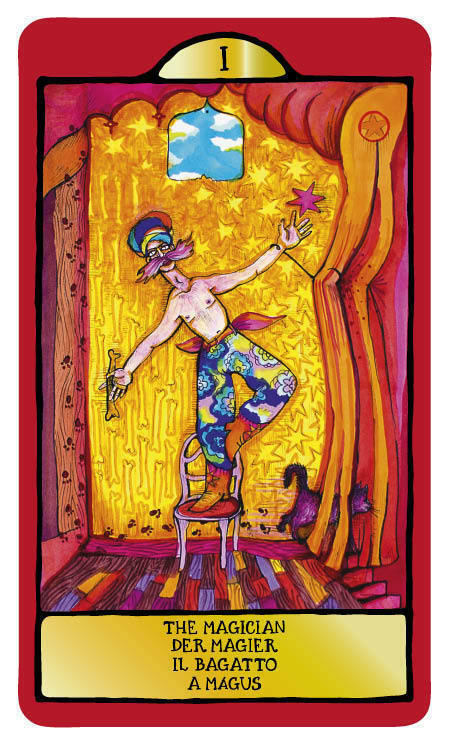 The Gypsy Palace Tarot by by Nora Huszka. Yesterday I was contacted by miss Huszka about her crowd funding campaign on Indiegogo to fund her deck. The artist is from Hungary, living in Berlin and at the moment travelling through Italy, and yes she is also a tarot reader herself so it seems she is living the gypsy part of her deck's name herself, isn't it. Curious to see it, a bit sceptical perhaps, one hears lots of themed decks comming out each day that are for the most part just flat uninspired images but here I must admit I like what I see, it's fresh, innocent looking but also playful and yes bathing in the gypsy atmosphere. You can see her indigogo campaign here and if interested help in funding it.